This particular PalmOS device was released for around $400 in 2003, a few years before the first smartphones. In essence it does the same job, just with a lot more limitations and of course you can’t make a phone call. 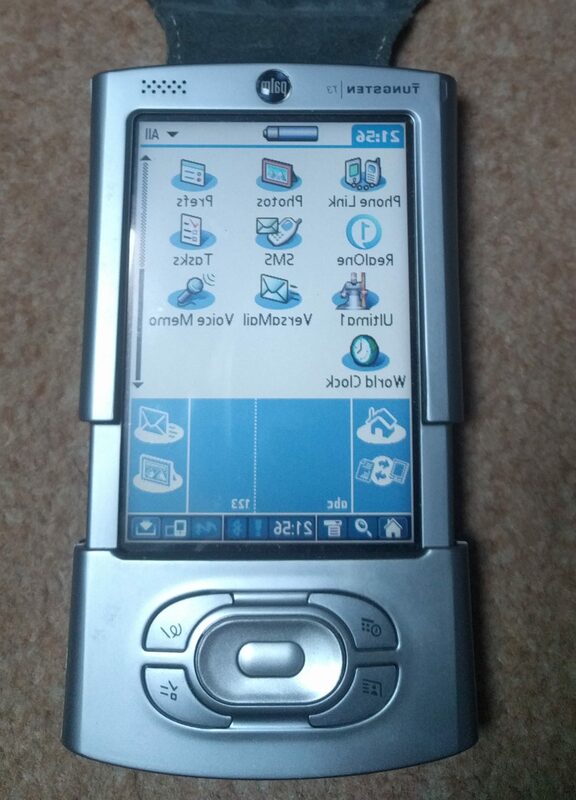 It has a 320×480 touchscreen, a 400Mhz processor and 64MB of RAM. These devices aren’t exactly in demand and are pretty much being given away these days. The Ultima ports in question were done around 2004 by Paul Chandler of SoftwareByPaul. The remnants of his GeoCities site are still available at http://www.geocities.ws/softwarebypaul/ but the purchase link points to the long dead palmgear.com website. This means that for now at least, these games have been lost with only the demos available for download. I’d happily buy the full version if given opportunity but for now will content myself with a quick blast around the U1 demo to get an idea of what the full game would have had in store. Some liberties have been taken and I assume this is the same engine used for the Ultima 3 port. There are certainly plenty of Ultima 3 elements incorporated with a party of 4 characters, field of view, magic shops no longer selling individual spells but instead offer healing/resurrection, etc… Combat takes place on a single screen allowing each party member to be controlled individually. The dungeons are all 2D and a lot less populated by monsters than I’m used to, with no trap doors, coffins or even secret doors as far as I can see. 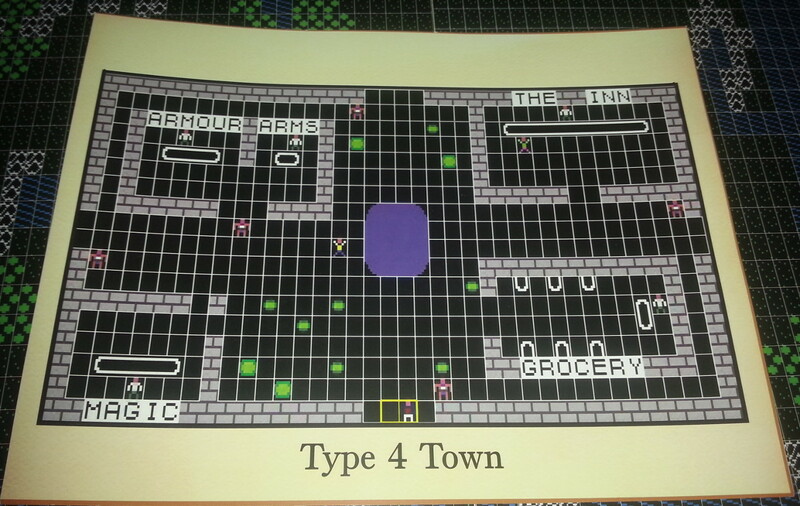 Other elements of Ultima 1 are in place with the map appearing reasonably familiar. Lord British’s castle has been shuffled around a bit but the usual elements were all there with a locked up princess, 3 store rooms (I don’t appear to have a command to steal from them?). There is no sound to speak of. 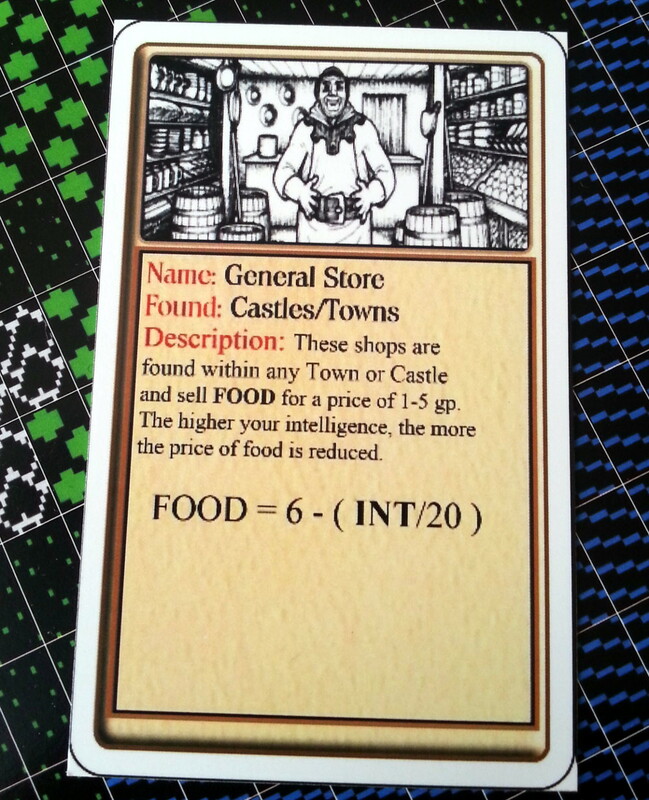 Without the ability to buy food, I’m not even going to attempt to get far enough into the game to see how stats work. Lord British does tell me I need to experience more, suggesting that the signposts may also have been gotten rid of in favour of something more akin to Ultima 3’s levelling up system. I wasn’t sure about this port at first but it looks like it could be OK from what I’ve seen, even if it is different to what I’m used to. 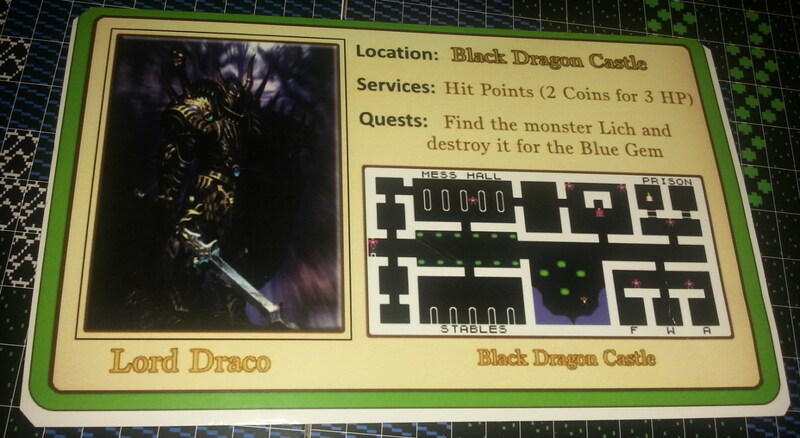 I expect the Ultima 3 port will make more sense rather than this hybrid. The T3 is actually not a bad little gaming device for this sort of thing with a nice clear screen for a gadget this old. Using the pen is quite noisy. I could imagine myself infuriating other train passengers were I to be tapping away on this on my commute. If I ever get hold of the full version, I may well try it and find out. 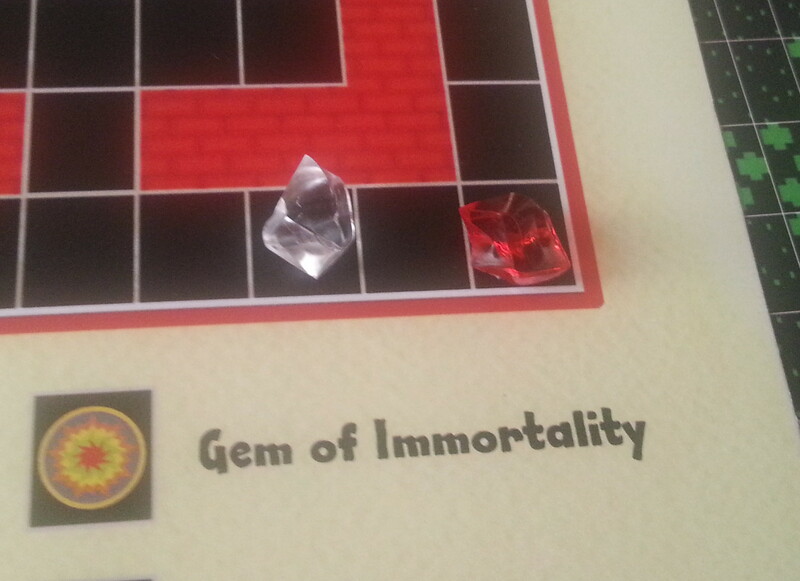 The first task today is rescuing a princess, so I head straight back into the castle I got the last gem from and for the first time set the board up as appropriate with all the guards dotted about. As soon as I kill the jester, the guards start making their way towards me. I’m taking the approach that they are as dim as their PC brethren and will always head towards me in a straight line, trapping themselves in corners and the like. This still doesn’t make this part of the game easy. On the PC they only track toward me when I get close enough so some are easy to avoid. Trying to stay out of their way here is a dead loss and about the best I can do is fight them one at a time. 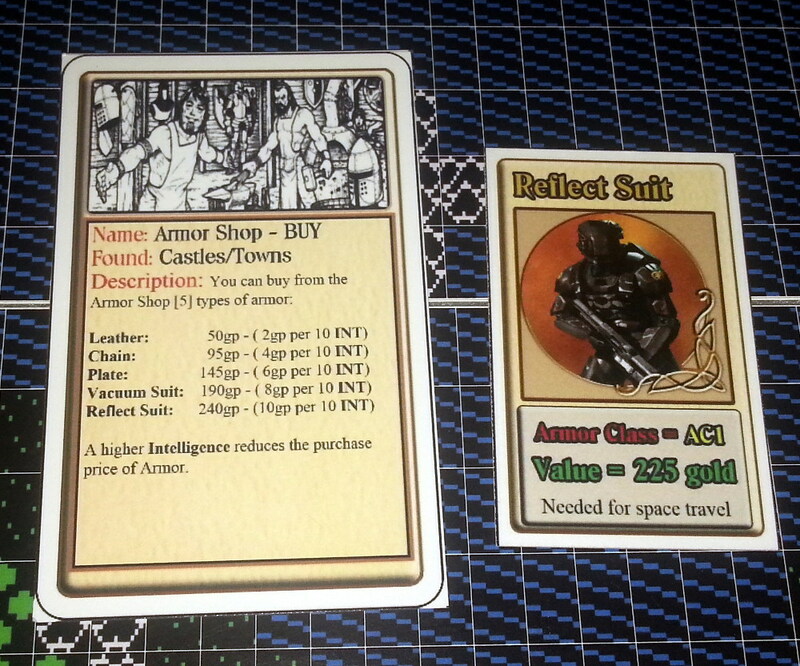 The guards card doesn’t tell me what armour class or level they are so I had to guess. Given that they have a monstrous 500 HP, I took them to be level 10 and AC 0. The 500HP takes some whittling down even with the equipment I’ve got and these battles soon start to hurt. I get 1000XP for the privilege every time so my level does get maxed out rapidly. 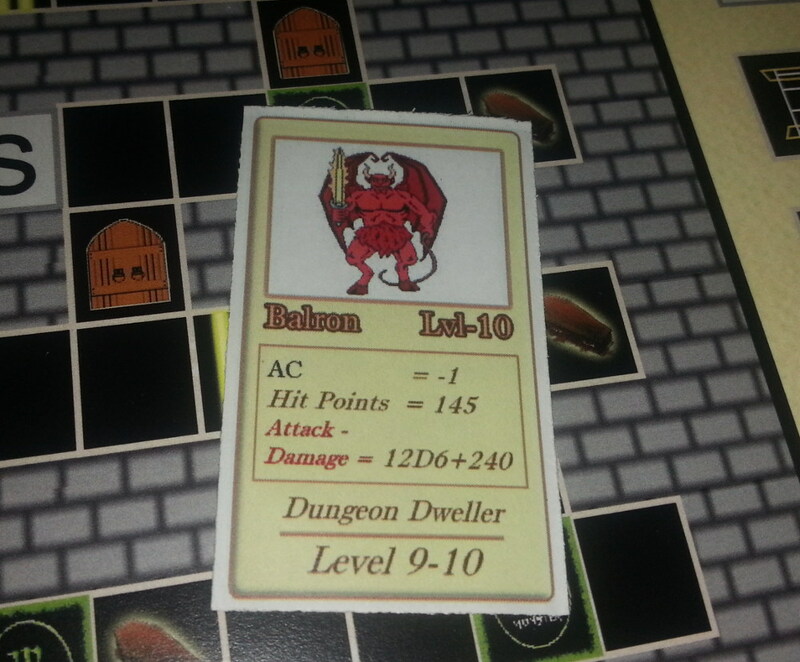 By level 10 I score a hit every time without needing to roll which is just as well against these guys. Having fought off the pack of ravening guards, the keys taken from jesters work a little differently here. Killing the jester gives me a 1 in 8 chance of opening the lock imprisoning the princess in this castle. If that doesn’t work, I can go to another castle and kill another jester with a 2 in 8 chance and so on. It does beg the question if I could just go round all 8 castles with that first key and not have to deal with the wrath of the guards for killing jesters but I don’t think that was the intention. 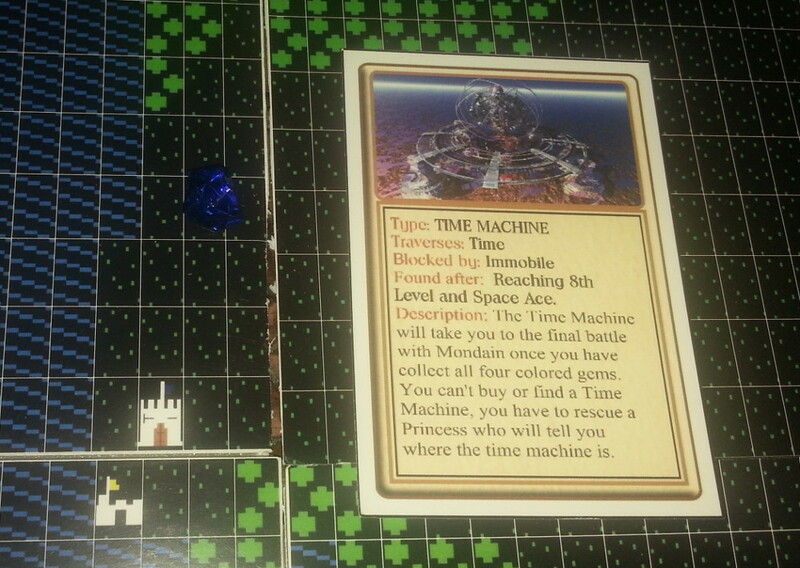 I eventually get a key that works by castle 5, rescue my princess and bag a time machine. I spend my remaining gold on HP getting up to about 5000 hoping that will be enough. Something that did occur to me here was that my character would now kill all level 1 dungeon critters in the first round of battle offering a zero risk means of rapid gold farming should I need it. I preferred to press on to the conclusion instead. 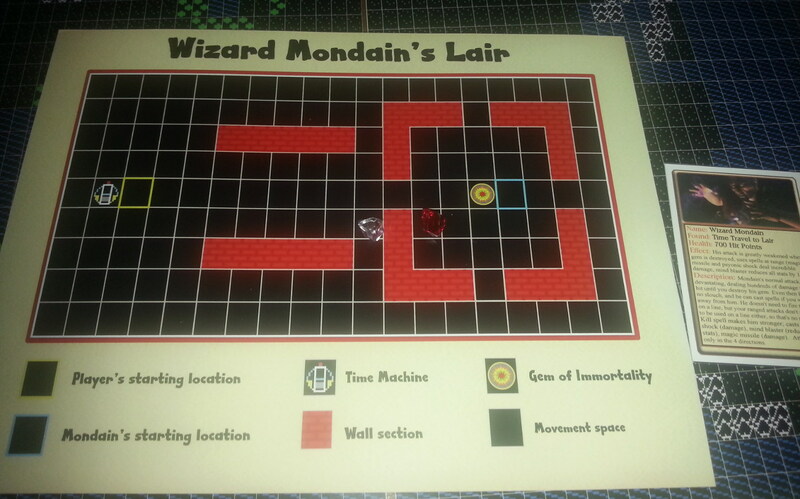 The final battle takes place in the familiar surroundings of Mondain’s lair. He has a range of attacks all of which hit automatically but don’t take effect through walls so I sneak up on him and we each face off on opposite sides of the wall. The moment I step into the gap he starts hurling spells at me, none of which are quite as nasty as I’d feared they might be. This is especially true of the mind blast spell which knocks 10 percent off my abilities but doesn’t affect my prowess in combat in the slightest. 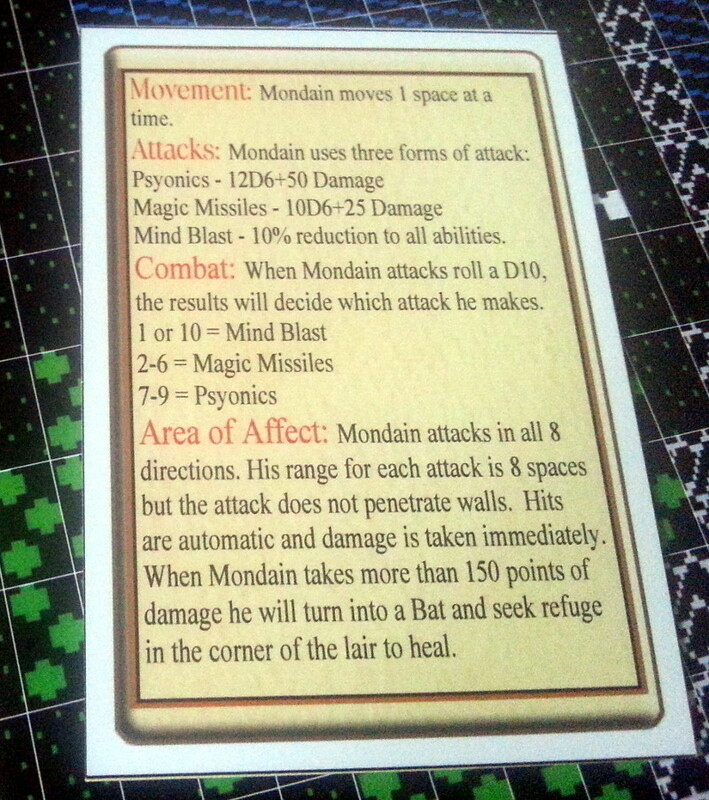 Mondain doesn’t have an armour class so I’m assuming 0 again which still means I score a hit automatically every time. 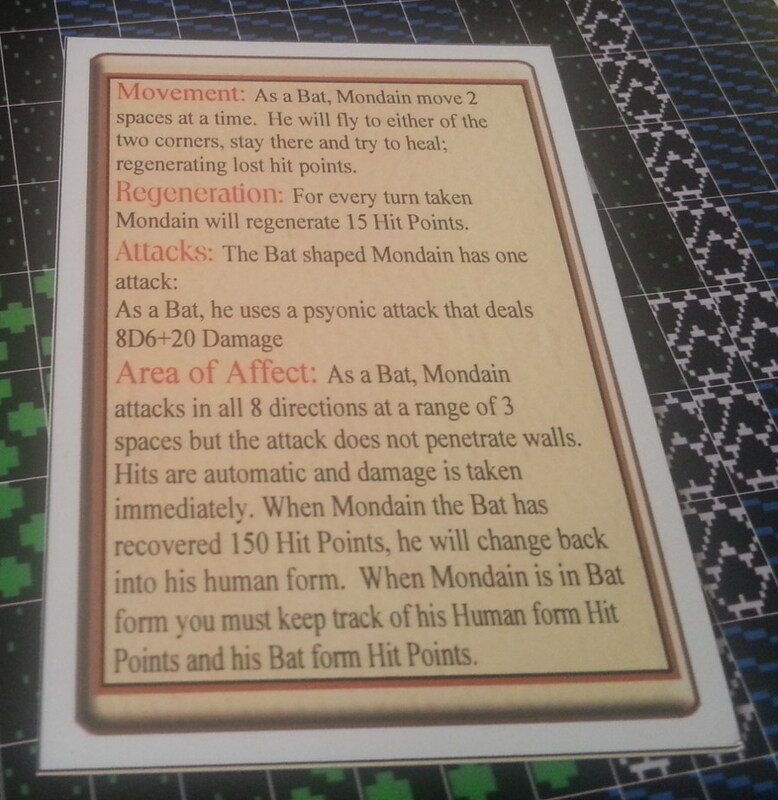 As such it doesn’t take many shots to do the 150 damage needed for him to morph to bat form and flap his way toward the nearest corner. Maybe not that triumphant then. I’ve played plenty of video games where the ultimate ending is anti-climactic but little to match this as of course there is no ending once Mondain is defeated. I just get the satisfaction of reclaiming my living room from the invading army of boards, cards and dice. I should offer a final opinion of the game at this point but I’ve never played anything like this before so it’s not easy for me to be objective. 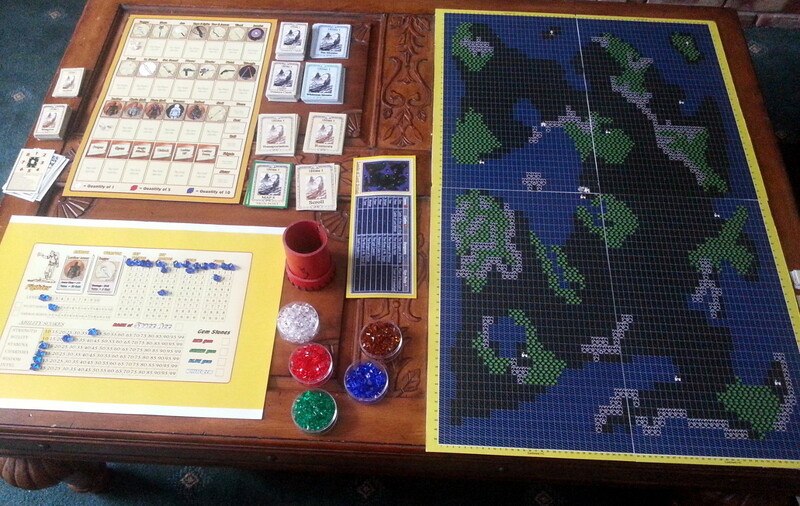 I’ll have a stab at it anyway but I should first mention that the game is still in playtesting and will evolve from the version I’ve played here. It could do with some tweaks and fixes but having come this far these would all be fairly minor. Judging the game in it’s current state, I certainly went into this wanting to like it but in all honesty I’d never have made it to the end if I wasn’t obliged to Joseph having promised to playtest it. You have to respect any fan project where someone has put this sort of effort into something just for the fun of it but I’ve simply spent way too much time pushing bits of coloured glass around this last week for my liking. It’s perhaps the solo nature of the game as much as anything. I always think of board games as a communal activity. Spending this much time playing one on my own doesn’t strike me as something I should be writing about in public. I can’t honestly think of anything I would ever actually do that would be more embarrassing to have to explain were some random stranger to catch me in the act. That isn’t to say I’ve not had some fun out of it and the time has passed strangely quickly whenever I’ve been playing. It doesn’t even come close to the more arduous games I’ve blogged through on here but I have been taking more and more shortcuts as the novelty wore off. 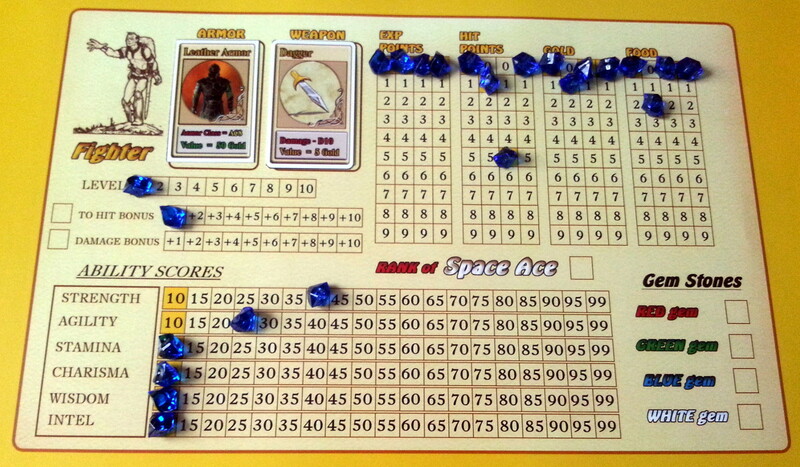 The ability to change the rules is certainly one advantage of this form of gaming. 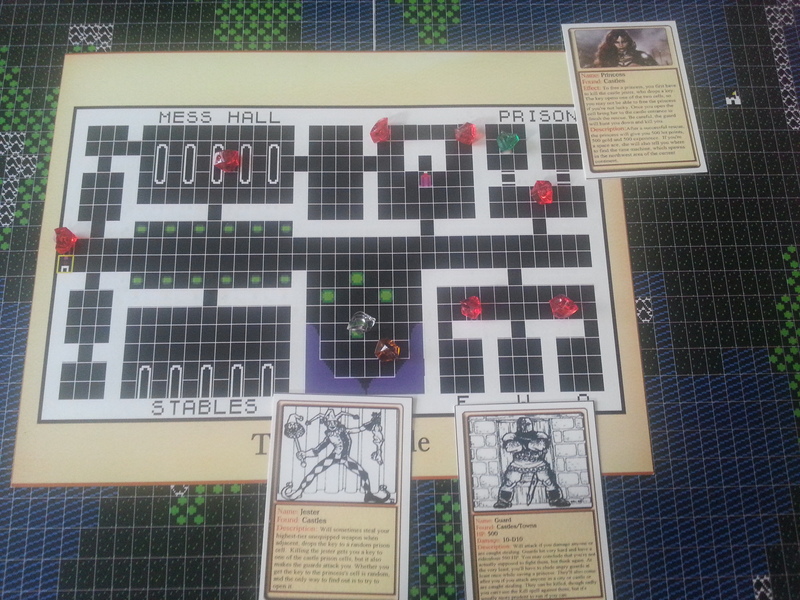 No one will be surprised that I’m not about to recommend that every Ultima fan should rush off and play this. I expect any reader will already know if this sort of game would appeal them and if it does sound like your thing then once it’s had a few tweaks, I don’t think you would be disappointed. As for myself, I intend to steer clear of anything to do with dice for the foreseeable future. I have to offer a huge thank you to Joseph Propati for being generous enough to send me this and of course creating the game in the first place. Whether it’s my cup of tea or not, I simply love the fact that this exists at all and it’s projects like this that have kept Ultima alive for so many years. This will be forming a welcome addition to all the Origin trinkets I’ve accumulated as soon as I can figure out where to put it. I’ve had a couple more sessions at this in something of a concerted effort to get my coffee table back again. I began by heading off to buy some armour at long last. The price doesn’t drop much despite my new found intelligence but I can hardly complain at the price for the best suit of armour. The armour class of 1 means any attacking creatures now have to roll 7 higher on the D20 before they can score a hit which is going to make a big difference to my survival chances. I spend my remaining money across Britain and Yew on a little food and a small pile of ladder up and down spells in preparation for the coming dungeon crawling. I visit the two local lords to take on both quests available in this realm, although I’m not sure quite how the signpost quests are intended to work here as I can’t spot anything in the manual about how much they would raise my strength by or which signpost to head for. Without that particular stat contributing in combat, there isn’t the incentive to raise it anyway so I’m going to concentrate on the creature quests one at a time. Something which hadn’t occurred to me with the random nature of the dungeon levels is that the ladders end up being in the same places on the random levels in order for them to meet up. This can make it very quick to skip up and down levels depending on how they work out. Regarding locked doors and trapped coffins, there is only a 1 in 6 chance of either. However both can be bypassed without even rolling if you have 80 or higher agility which I happened to get to when raising intelligence in part 2. This makes agility the most useful stat in the game and it came in extremely handy that I’d inadvertently raised it by that much. 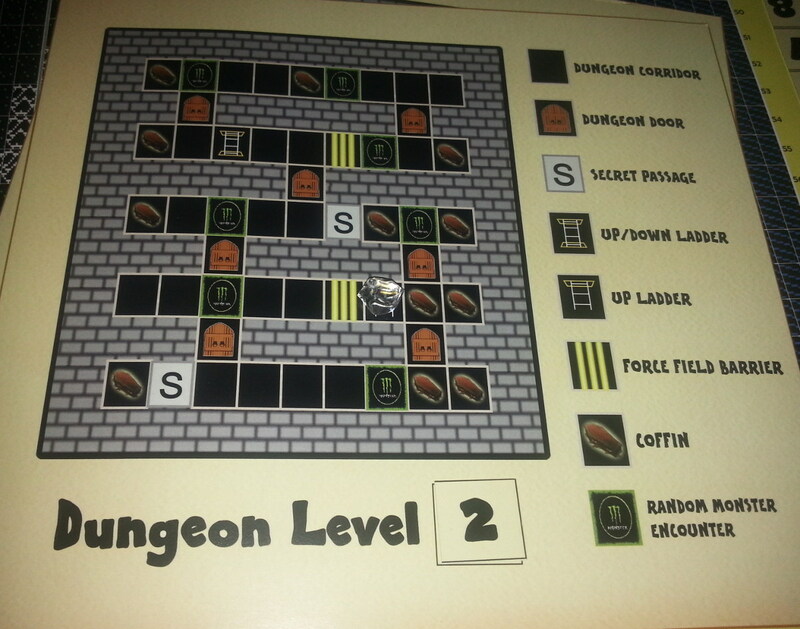 I decide to work my way down the levels the long-winded way and the monsters get progressively tougher. 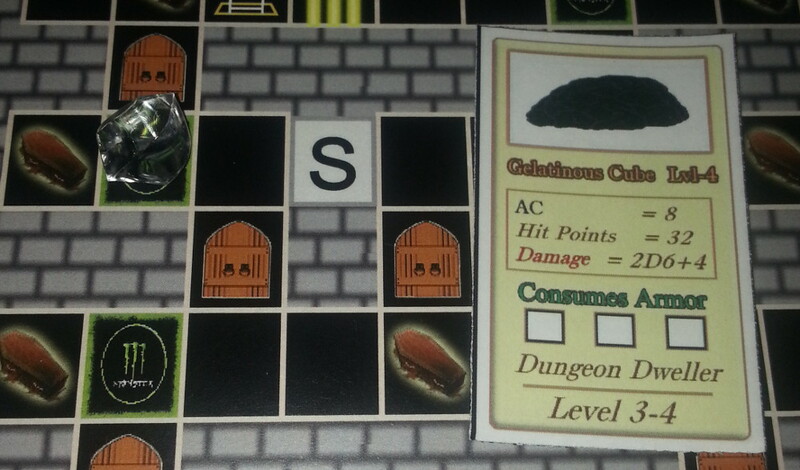 A couple have some additional features like the gelatinous cube which will eat your armour if it scores 3 hits. It also happens to be the object of my quest and luckily for me goes down before it can get that 3rd strike in. 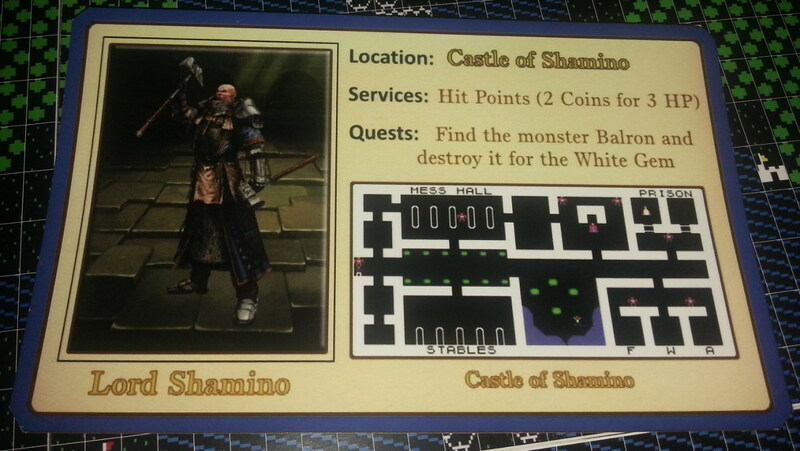 From here it’s onto a fresh monster free continent and a quest to kill a Lich. All the monsters on the previous continent vanish when a boundary is cross other than sea monsters which could potentially follow me if my table was big enough for more map pieces but since it isn’t they are vanishing here also. 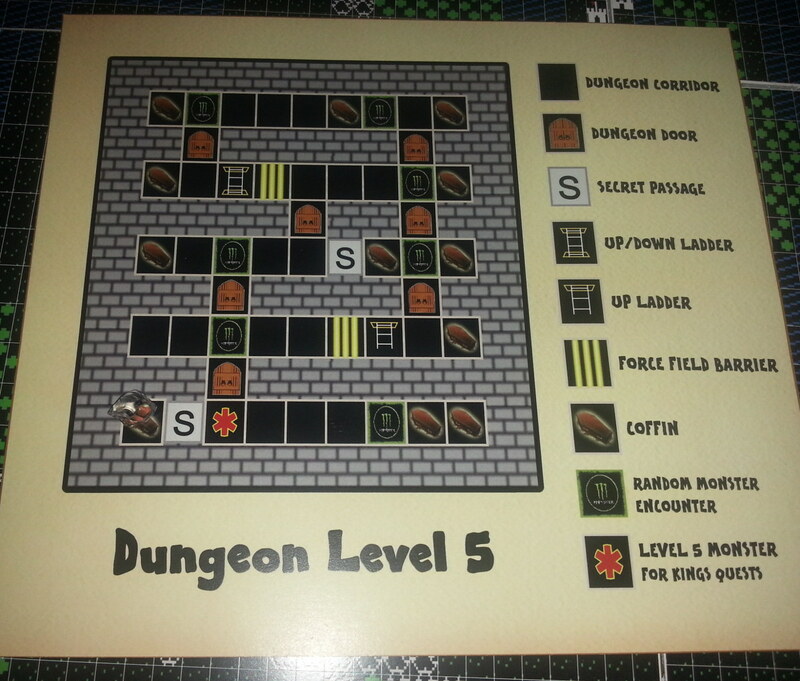 On my route to the Lich, I notice one of the dungeon maps has two ladders up and none going down which can’t be right. I use up one of my ladder spells to get around this. 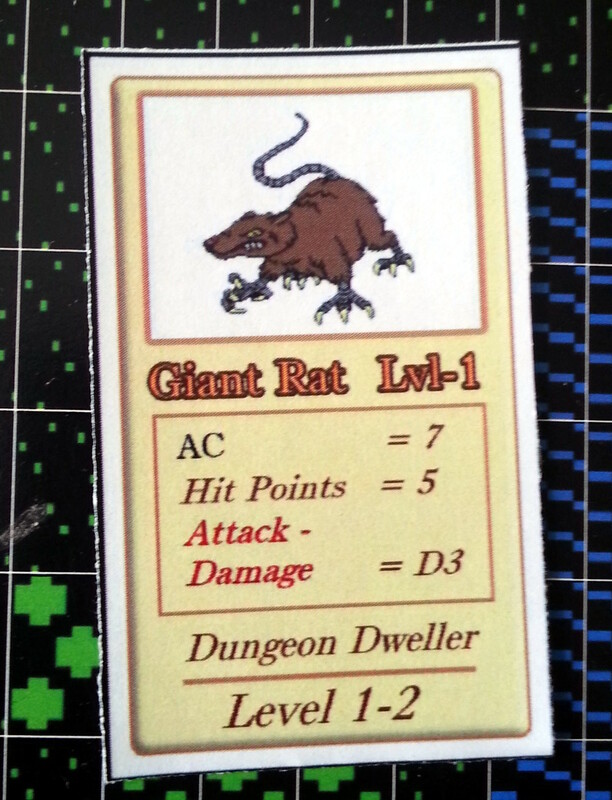 For some reason I’m expecting the Lich to be in the level 9-10 monsters so I foolishly take on a couple of these behemoths before I realise my mistake. The mind whipper above is no more than average for those floors and deals out some serious punishment before I run away. I do still have enough health to take out a lich on the way back up and escape the dungeon with a pitiful 100 or so HP left over. At this point I take the trouble to add up all the HP of the downed monsters and realise that I’ve gained a full 3 levels in the process. You really can rack up huge XP on the lower levels in these dungeons. 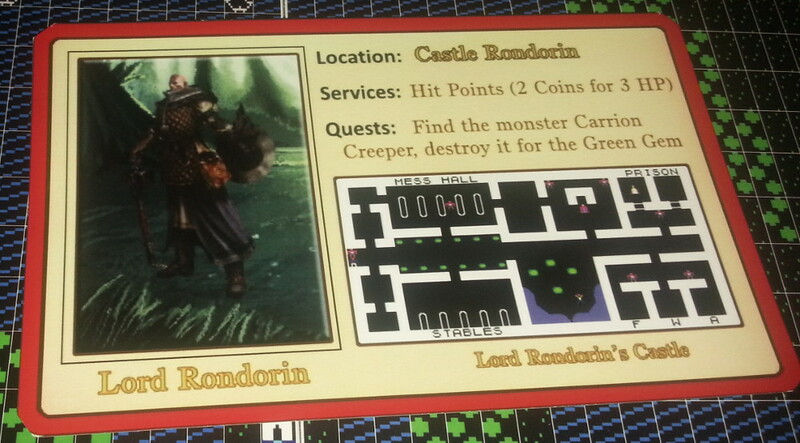 Onto the next realm and those extra levels come in extremely handy on my quest to defeat a Balron. I take the easy option this time and ladder down and up most of the way. The final realm isn’t going to prove much of a challenge by comparison. I notice a level 5 monster quest square on the level 5 map at this point which I’m not sure about but I ignore it and soon kill my carrion creeper and bag the final gem. My fighter is now up to level 8 and closing in on being ready for Mondain. 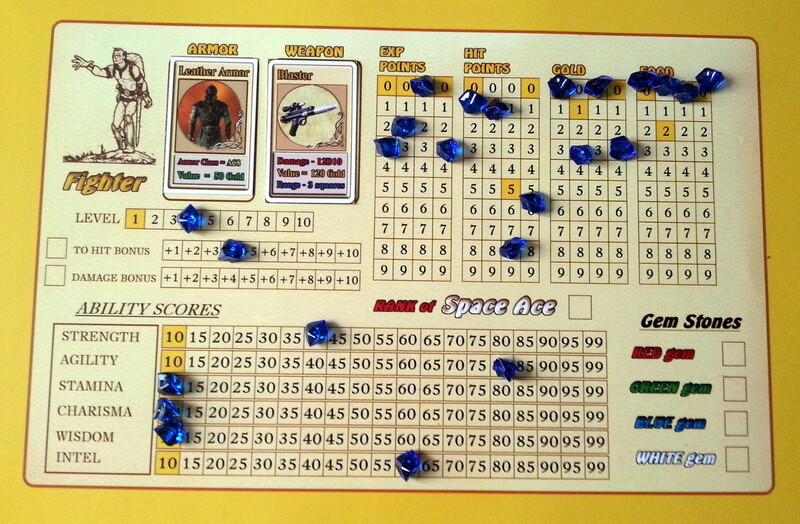 With no spacefaring in the boardgame for now, I look to be all set to finish this up in part 4. The dungeons have proved to be my favourite part of the game so far. The level of challenge scales nicely throughout each level with levels 9-10 enough to make even the most experienced character wary, whilst also offering enough reward to make it worth the risk. It’s possibly a little too much reward, three of those balrons would be about enough to raise my character a level on their own. 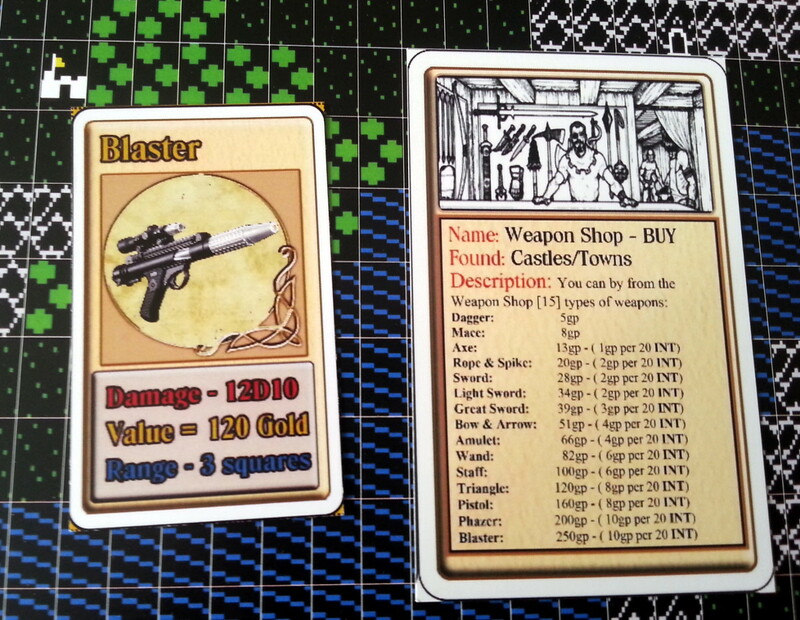 Then again I possibly shouldn’t have that blaster I’ve been using. I’m not so sure about the secret walls. With only a 1 in 6 chance of actually being able to see them it’s not worth the detour as a rule so I’ve just been ignoring them but at least the option is there. 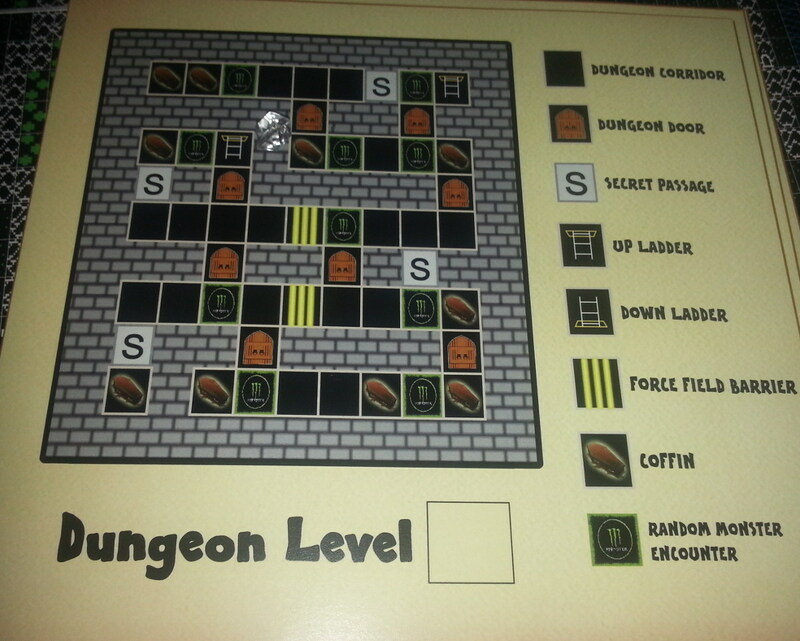 Above all the dungeons just work well as a board game without too much unnecessary stat keeping. 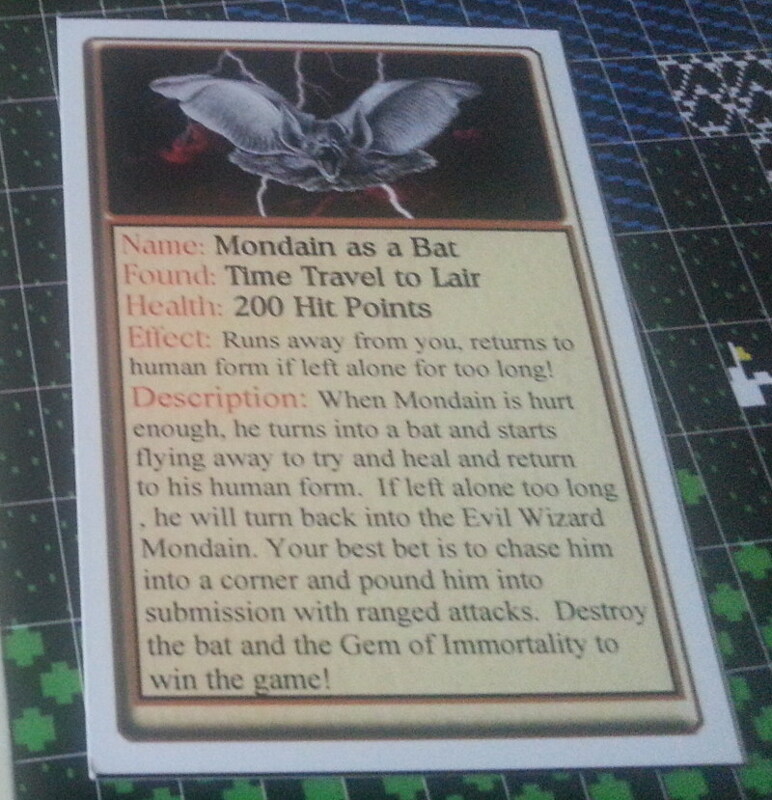 I simply have to draw a monster card and fight that monster without any faffing unless I decide to run away. I’m less convinced by the overworld in this form. 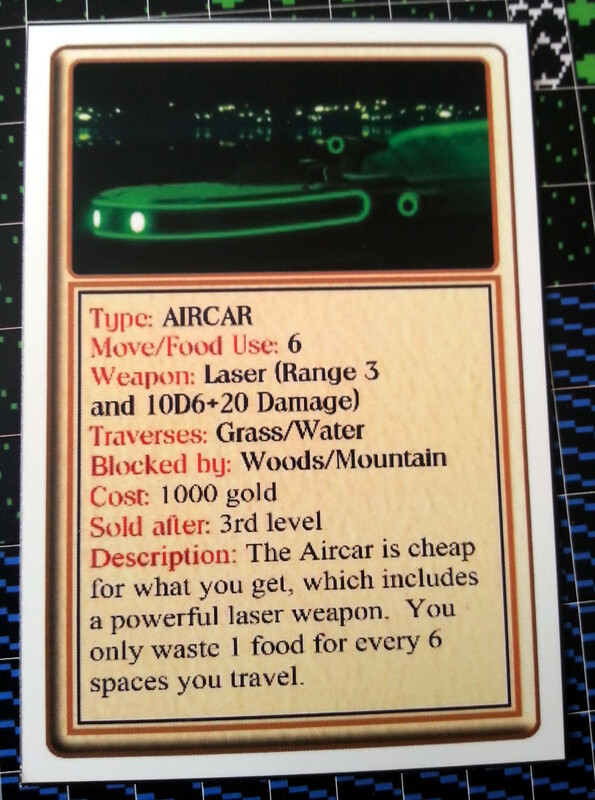 It’s fine in the early stages on foot but now I have an aircar and can travel 4 times faster than any monster there seems to be little point to generating the random monsters and therefore doing much more than moving my food counter down. This is especially true now that at level 7+ three monsters are being generated for every 10 moves. I just don’t have the patience to keep track of them all when I’m not intending to do anything other than avoid them. 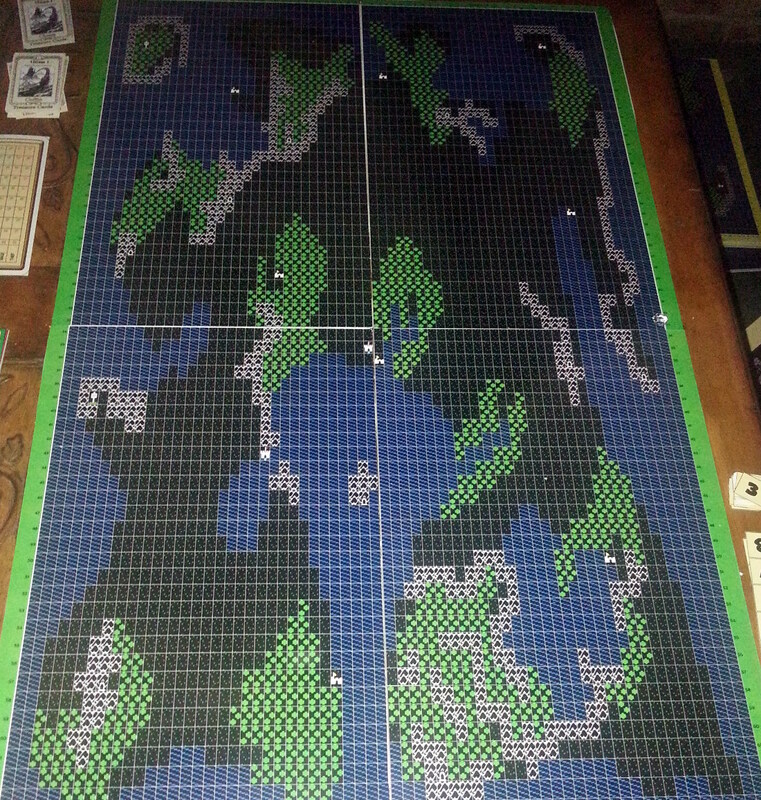 I could imagine the monsters quickly building up until the map looks something like the time of legends in Ultima 2 except I’d have to move every monster by hand. Those who are more into their boardgames may well feel differently to me but it almost renders the boards for the other 3 maps moot. Perhaps the aircar needs to be held back until much later in this version so that the player has to work with a boat for a while and travel the land on foot. To go with this, I’d much prefer to see the monsters level up instead of numbering up perhaps with extra sets of wilderness monsters for correspondingly higher character levels. Alternatively to level matching monsters, I quite like the idea of having a different set of cards for each land so that some of the realms are more dangerous than others. Of course I always liked RPG’s where some areas were shown to the player early in the game but really off limits due to their difficulty. It gives a clear goal to work toward while still keeping an open world for the more foolhardy. I know others don’t always feel the same (for a prime example see Spoony’s Ultima Underworld 2 review) but if nothing else it would make the Lands Of Danger and Despair a lot more fitting of the name. This is of course an entirely unofficial game and available for free with everything you need to play the game on Boardgame Geek for self printing and assembly. There is a whole lot of it so be prepared to do quite a lot of preparation if you want to try this out. The photo above just has the bare minimum to get started with plenty more cards placed to the side for as and when I get to them. There is also a 70 odd page rulebook which I’ve skimmed through but intend to get to grips with as I play the game rather than trying to take it all in at once. The plan here to blog my way through a game just like any other version, except you can expect more detail than normal to reflect the slower progress of this silicon free version. 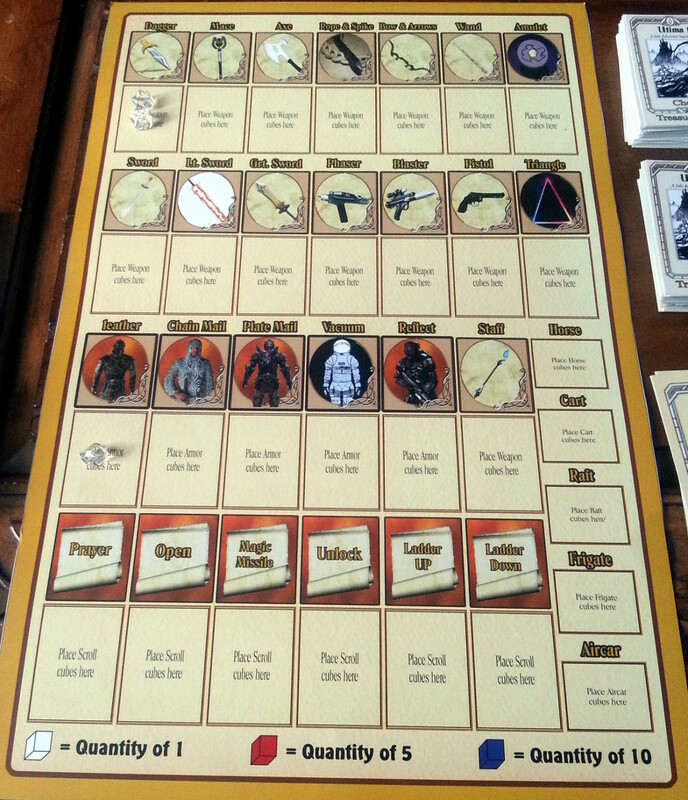 To go through the main components, the sheet above is my character reference card which has a variant for each of the four character classes. All the stats can be tracked on here with counters which works quite well as long as I don’t bang the table. I’m going for a fighter here and put my stats into strength and agility like I would on the PC. All characters start with leather armour and a couple of daggers (there is no cloth armour in this version). All the stats here should be instantly familiar although I’m soon to find that things don’t work how I’m used to. The inventory sheet keeps track of my inventory as you might expect. This hasn’t seen a whole lot of use yet but should come in handy when I start getting some items. 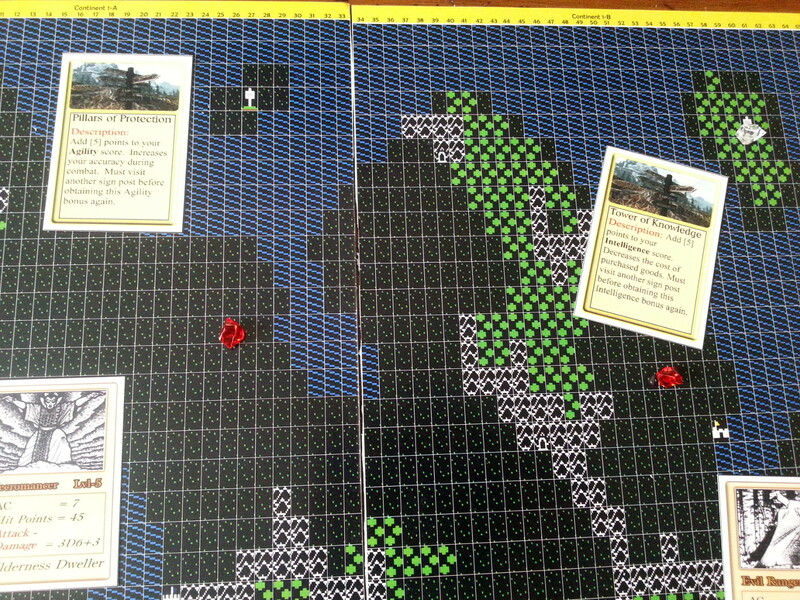 There are 16 map boards for the game with each realm split into 4. 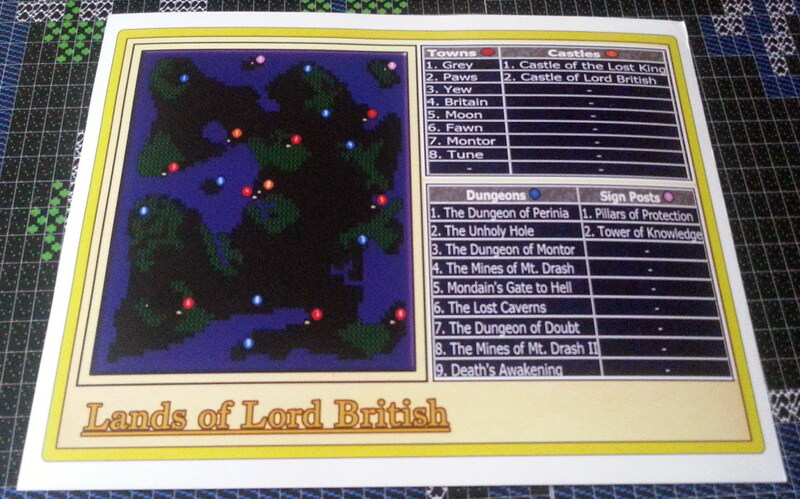 I’ve laid out the Lands of Lord British to start with as I don’t expect to be moving to another continent any time soon. I start next to Lord British’s castle and my first thought is to head for Britain to grab myself a bow. 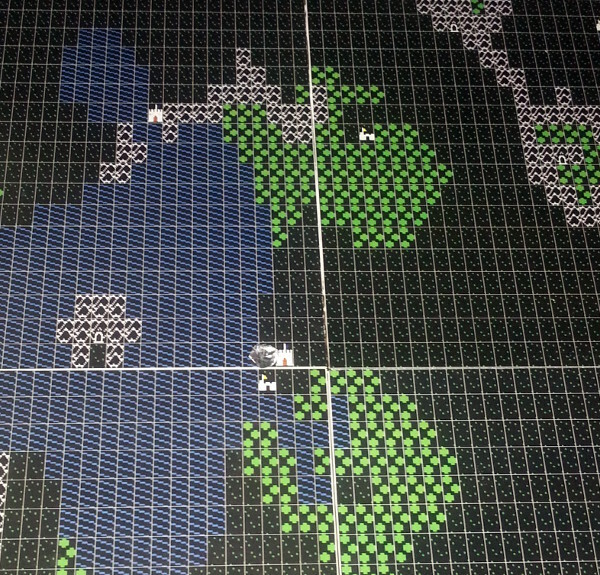 I’m free to move in all directions around the map as per the regular game, except I’m also able to move diagonally here which is something of a novelty for Ultima 1. On foot I eat 1 food for every 2 squares moved + a monster will spawn every 10 steps all of which I have to keep track of myself. I don’t have to worry about either of those stats quite yet as I step into Britain one move later. Each of the 4 realms has a guide to the locations available. There are 8 types of town, each with their own corresponding board and Britain is a type 4 apparently so I fetch that board out. I’m supposed to put tokens down for the guards at this point but I’m not planning on stealing anything so I give it a miss for now. The jester moves around randomly on the roll of an 8 side die and may steal from me if I let him get adjacent but he is easily avoided just like on the computer game. 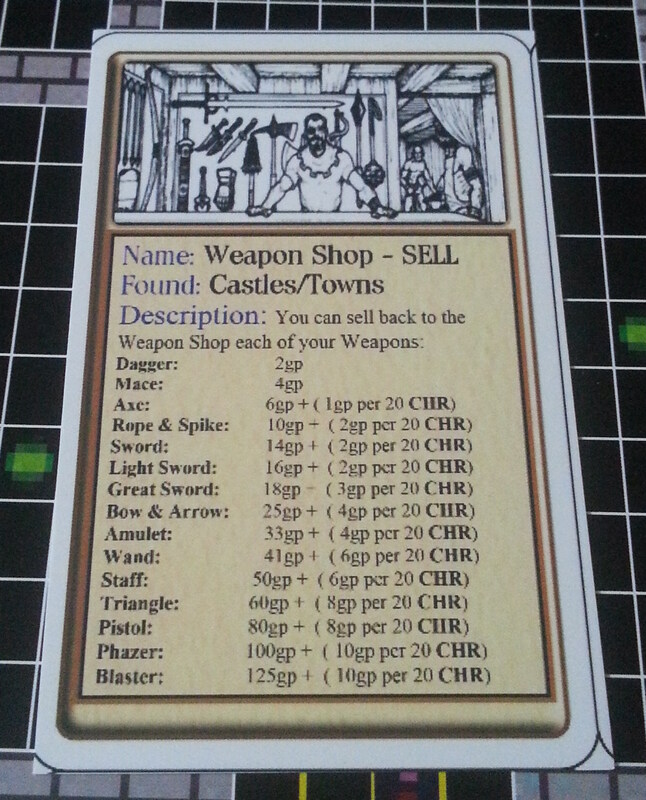 The weapon shops all have a set price list which can be improved if you have the appropriate stats (which I don’t). A bow is still only 54 gold if I remember right which seemed cheap at the time only for me to then realise that I’m not allowed to use it on this version until I’m level 3. So much for that plan. I think strength was what counted on the computer and I’m wondering if I should have put all my points into that particular stat at this point. I decide instead to head for the nearest dungeon. I have to spawn a monster before I can get there. These are generated at a random distance from me (a six sided die + 4) in a straight line in a random direction. Once spawned they chase straight after me moving an extra step every 5. On foot there isn’t much hope in my running away so I turn and fight instead. Combat here isn’t quite what I expected with stats not playing any part except for the level of my character. Basically I take the level of my character and look up the number in the sheet on the right above (20 in this case). I then take off the armour class of the monster (5) and any to hit modifiers I might have (these are an optional bonus for each level gained). 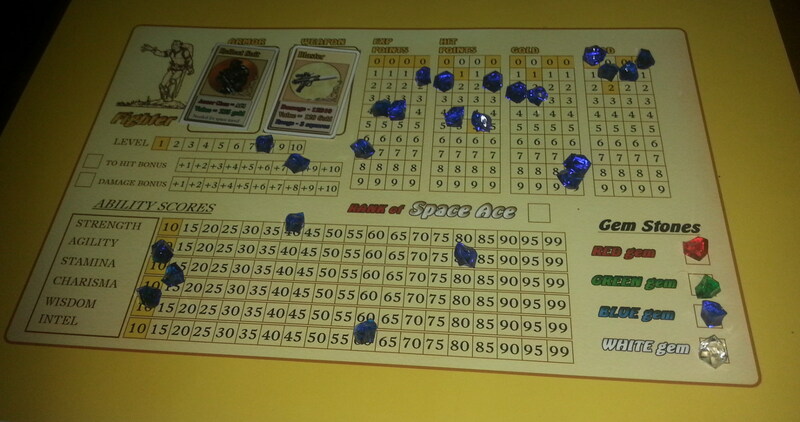 I started with a +1 hit modifier so I have to roll 14 on a 20 side die to score a hit. The ranger on the other hand only has to roll a 9 so I’m at a serious disadvantage here. 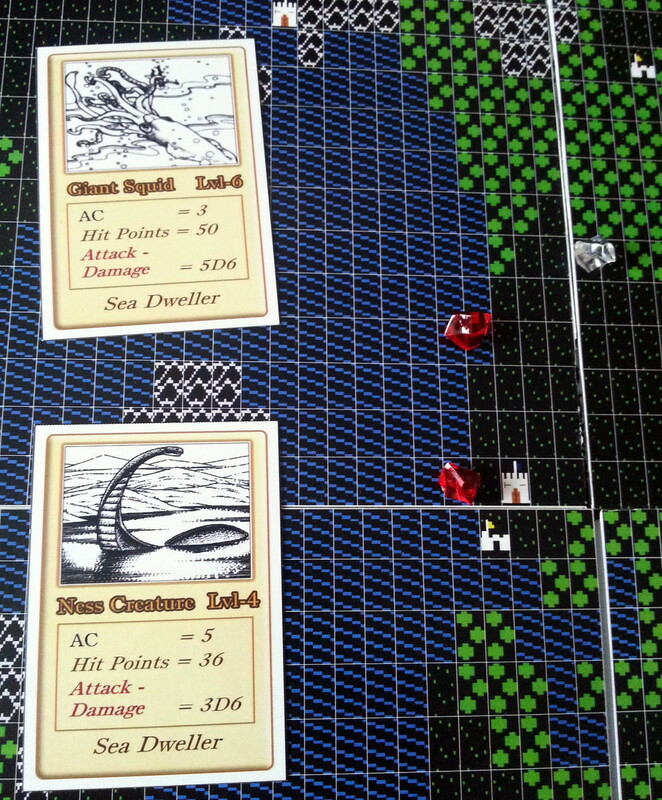 My dagger does a roll of a 10 sided die for damage with this ranger doing 2D6 +6 which makes things worse. You can probably imagine how this went. I ended up losing about 3/4 of my hit points in this first battle and I decided that heading for the dungeon might not be such a good idea after all. My strategy changed to loitering around Britain until I find my feet. 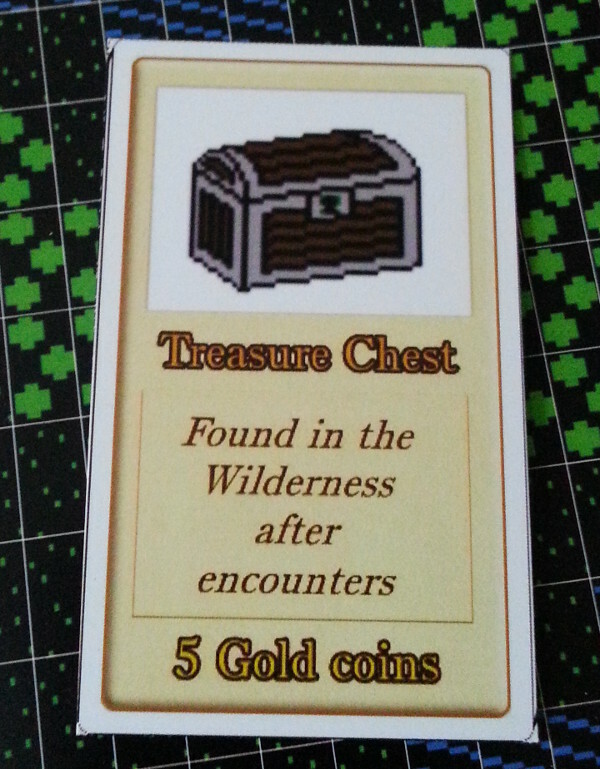 The monsters do all drop chests at least so I get to open the chest which means picking a card from the chest pile. I also got 64XP (twice it’s HP) but level 2 isn’t until 1000XP. Not feeling suitably rewarded I head back to Lord British’s castle to lick my wounds and spend all my money on HP (at a cost of 3HP for 2 gold). After this point, the combat started to get a little easier and I was far better rewarded in terms of gold. I carried on spending my money on HP and got somewhere close to where I started after another 3 or 4 monsters were out of the way but I’m far from convinced that this is the best strategy as another encounter like the first would still wipe me out at this point. 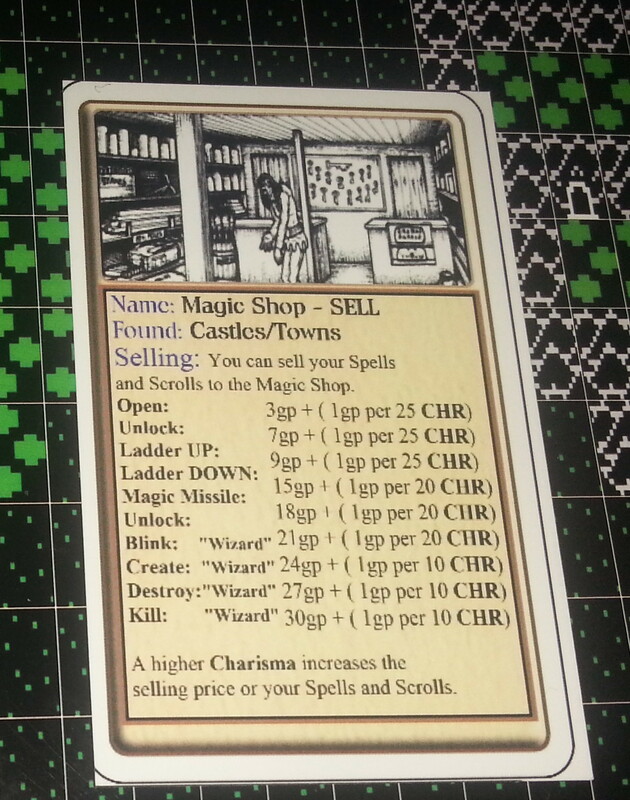 I decided to take a peek at the dungeon monster cards to see if I fancied my chances there any more only to realise that the cards were missing. 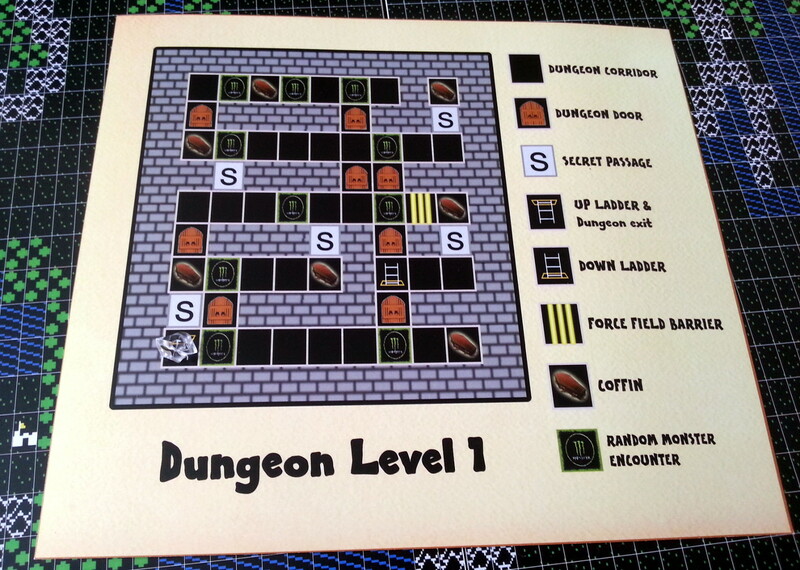 A quick trip to the printer later and I decided the level 1-2 dungeon monsters did indeed look far, far easier + I’ll gain HP when I exit the dungeon so they have to be the way to go. 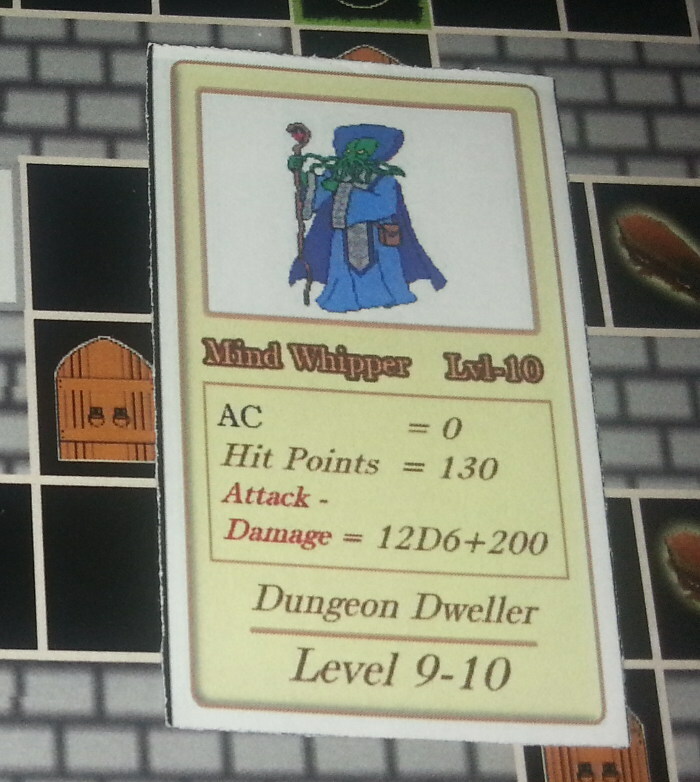 I head for the dungeon once again and just about make it with 80 HP left. I really hope I can earn some more before I have to make the trip back again. I reckon I can finish Ultima 1 in under an hour on the PC. I must have taken about 3 hours so far and I’m only 1/4 of the way to level 2 and I’ve not even got to the first dungeon. The main thing I’m taking away from this is the speed of the game which is incredibly slow when you have to do everything by hand. It’s undoubtedly going to speed up as soon as I can get the better equipment (and don’t have to refer to the rules constantly) but I can’t see that I’m ever going to choose this sort of boardgame over a computer game as a rule. Having said that, it gets me out from in front of a screen (often welcome since I became a full time programmer some years back) + it’s kind of relaxing to slow things down. I’ll stick with it and see how I feel at the end. I certainly love the presentation and can only imagine the effort that must have gone into putting this together. I just hope it gets a little easier on my poor fighter in this first dungeon or I may start having to cheat.